Life's most ironic fact: When people know they can control when they die-they can, and often do-choose to live longer, and with less anxiety and worry. Our greatest end-of-life fears are being trapped in unbearable pain, or in total indignity and dependency such as the dementia of Alzheimer's disease. The BEST WAY to Say Goodbye details the emotional, practical, clinical, legal, moral, ethical, spiritual, religious, and political aspects of Voluntary Refusal of Food & Fluid – the peaceful alternative to Physician–Hastened Dying, which is legal everywhere for competent adults. Political challenges are daunting and increasing: We might suffer more pain if new laws criminalize doctors for prescribing medications at doses non-medical regulators "judge" as intended to hasten dying. Recalling private conversations around our kitchen tables will no longer be considered evidence of a patient's wishes if 23 American States (or more) pass laws to restrict family members from making the end–of–life decisions that they know their loved ones would want. What can we do? We must diligently compose strategic documents that will empower our Proxies to overcome future challenges. 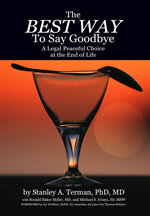 The BEST WAY to Say Goodbye: A Legal Peaceful Choice at the End of Life is the first book to present everything readers must know to diligently compose strategic documents to empower their future Proxies, especially if they wish to Refuse Food & Fluid-either by tubes or by forced feeding via the mouth. Psychiatrist Dr. Terman's experience in end-of-life clinical ethics includes founding and leading the non-profit organization, Caring Advocates, whose staff offers individuals and other professionals advice and second opinions on creating and implementing Living Wills and Proxy Directives. The BEST WAY to Say Goodbye provides details to empower Proxies so they can overcome challenges to honoring the reader's choice of Last Wishes. Multi-authored poignant memoirs and humorous stories add to the practical guidelines and forms, and its "book-within-a-book" format makes it comprehensive for professionals and user-friendly for all. How to select an appropriate proxy/agent. How to complete several forms (and why all are necessary). How to alert 9-1-1 first responders and make your most current forms available when critical decisions need to be made. A story shows how a hypothetical person's ironclad strategy successfully overcame a series of challenges. 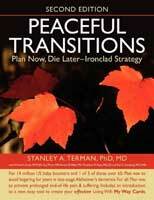 He started planning at age 45 and attained his goal of a PEACEFUL TRANSITION that was also TIMELY: neither prolonged nor premature at age 90. What are the greatest end-of-life fears? Days to weeks of unending, unbearable pain and suffering. Months to years of lingering in Advanced Dementia. Worse: you may suffer from BOTH. This book's brief review shows traditional Living Wills do NOT remove these fears. Yet two legal rights let you forgo spoon feeding--if someday you suffer from Advanced Dementia. Refusing life-sustaining treatment is a well-accepted choice, but this decision alone cannot help patients whose devastated brains are in healthy bodies. What can? Natural Dying, which includes forgoing spoon feeding while receiving all Comfort Care. Some argue spoon feeding is basic care and thus obligatory. This book presents clinical reasons why spoon feeding is medical treatment. A Catholic priest/health ethicist's guest essay explains why religious patients may refuse spoon feeding if a condition makes treatment extraordinary or disproportionate. --Comforting arguments, if you wish to respect the sanctity of life but do not want to prolong dying if there is no other life-sustaining treatment to forgo. 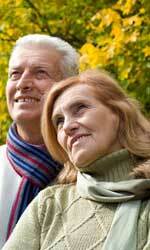 Available only through purchase of Caring Advocates Living Will Planning Package. 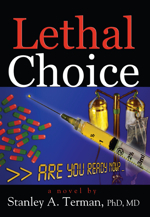 A Medical Thriller by Stanley A. Terman, Ph.D., M.D. From conspiracy to enlightenment- A medical thriller based on the premise that insurance companies must promote greater willingness to hasten dying to increase their profits. Includes the author's position paper on Physician-Assisted Suicide, and a “How To” guide to the alternative — A legal peaceful way to hasten dying. About 330 pages, shrink-wrapped, 7 by 10 inches, hardbound or trade paperback, available in books stores soon, or on the web. Unabridged audio version coming soon. 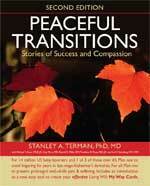 Free excerpts of initial chapters (including audio) are on the web site. What if the CEOs of health and long-term care insurance companies, whose bonuses depend upon increasing profits, reached their last resort to decrease costs and now must encourage patients to hasten dying? What if they found a research physician who craved fame and fortune for his two contributions? A computer program that allows totally paralyzed patients to commit suicide, and a trio of prescription medications that are lethal when combined, but individually can slip under the radar of the Drug Enforcement Agency. To produce a video documentary to influence patients and doctors to hasten dying, only one component would then be missing: their star. This patient would deliver an eloquent, passionate, and persuasive speech just before he voluntarily demonstrates that Physician-Assisted Suicide is peaceful and patriotic. A long search leads to a decorated war hero who is nearly quadriplegic from end-stage Lou Gehrig's disease. His mind is clear and his rhetoric is charismatic, but there is one potential obstacle: his undying devotion to his feisty daughter. The couple's desperate attempts to save their own lives as well as the patient's lead them into a maze of end-of-life ethics and physician bias. To emerge, they must learn how a father's love can transcend even death itself. © 2007- 2019Caring Advocates or Stanley A Terman. All Rights Reserved.